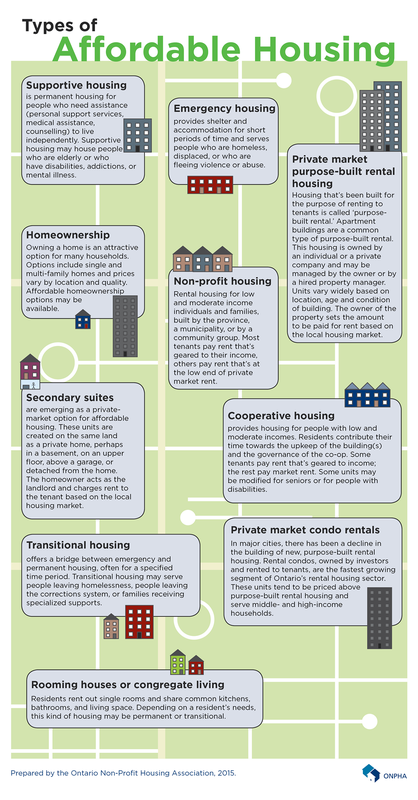 The below infographic, published by the Ontario Non-profit Housing Association, acts as a handy guide to the number of housing options that exist in the province. This post will focus on three of these housing options mentioned: (1) emergency housing, (2) co-op housing, and (3) transitional housing. In many cities, shelters are the primary response that communities have to homelessness. The role of these shelters extends far beyond providing temporary housing, they also provide clients access to a network of a wide variety of resources. These resources can include everything from access to food and basic healthcare, to informal counselling and employment services. Specialized shelter services exist for certain subgroups of the homeless population, and other individuals who use shelters (e.g. shelters designed for women fleeing abuse). In major cities like Toronto, there is an urgent need for specialized shelter initiatives for LGBTQ2 youth, who are overrepresented in Canada's homeless population. A recent Toronto survey estimates that 25-40% of all homeless youth in the city are LGBTQ2. Many of these youth, who left home because of the discrimination they faced, often end up facing homophobic and transphobic violence in the shelter system. To date there are zero specialized housing initiatives in Canada that address their needs. However, Toronto City Council recently approved 54 new shelter beds specifically for LGBTQ2 youth as part of its 2015 budget. An official announcement of these new shelter spaces is expected in the coming months. Co-operative housing provides housing for individuals with low to moderate incomes. Co-ops include subsidized units and units that cost market rent. Funding for subsidies varies across municipalities and provinces; for example, in Ontario the provincial government no longer funds housing co-ops, while subsidies are available in Toronto for the vast majority of co-ops, due to federal funding. This kind of housing is “rooted in the principle that members [of a housing complex] should be empowered to make decisions about their housing”. Since ownership of co-ops is collective, decisions in co-op housing tend to be governed by a democratic process. Applications of this kind of housing solution have often been applauded because they present individuals with greater autonomy over their housing. A recent study of Aboriginal housing cooperatives in Canada found that co-op housing encouraged self-determination and feelings of community among members. Transitional housing is defined as "an intermediate step between emergency crisis shelter and permanent housing". These programs are designed to provide clients with a safe and secure environment where they can begin to rebuild their lives. While transitional housing services are more long-term than emergency shelters, time limits are still enforced in most programs. Depending on the focus and the resources of a transitional housing service, the maximum duration for a stay can vary from a few months to a few years. In order to be effective, transitional housing services require the availability of affordable, permanent housing for individuals who are moving on. The rising costs of housing jeopardizes the continuity of such programs and the progress that participants have made. In the absence of affordable housing, there needs to be adequate supports to help these individuals. If these supports do not exist, participants risk re-entry into a cycle of poverty and homelessness. We also need to consider what happens to individuals who do not see significant improvements over the course of their stay in transitional housing. Since this housing option is often time-limited, where would these individuals go? This is one of the problems inherent with transitional housing, and presents us with the need for alternate non-profit housing options.